The Marion Star described Roush as a “sleight” man who had never so much as had a speeding ticket before he murdered Mr. and Mrs. Myers. Note: the following is taken from an eye-witness account that appeared in The Marion Star. On April 26th, 1939, at exactly 8:00 p.m., 49-year-old Harvey Roush entered the white-walled death chamber at the Ohio Penitentiary and seated himself in the state’s electric chair. Working quickly, two prison guards strapped an electrode to his ankle and another to a clean-shaven spot on his head. The electrodes were backed with wet sponges, and as the guards cinched the strap under his chin, a trickle of water ran down his face. Next they tightened down the leather straps and hooks that would hold him in place when the electricity began coursing through his body. Lastly, they covered his face with a leather hood. Their preparations finished, the guards stepped back. It was now up to the warden to give the final signal. Harvey Roush, the last person from Marion County to die in Ohio’s electric chair, committed a crime of senseless and appalling violence that, even now, is shocking. It’s a Depression-era tragedy in which two families were destroyed. Shortly before 11:30 p.m. on Saturday, April 30th, 1938, two young men spotted a farmhouse on fire on Route 423 (known then as the Delaware Road) just north of Waldo. They went into Waldo to raise the fire alarm and returned to the house a short time later with some other men. They were able to pull the homeowners, Homer and Mineola Myers, from the blaze. Mineola was already dead and Homer died shortly after arriving at the hospital. To law enforcement members arriving on the scene, it was immediately clear that someone had murdered the couple. Mr. Myers had a bullet wound to the head and Mrs. Myers had suffered a severe beating. 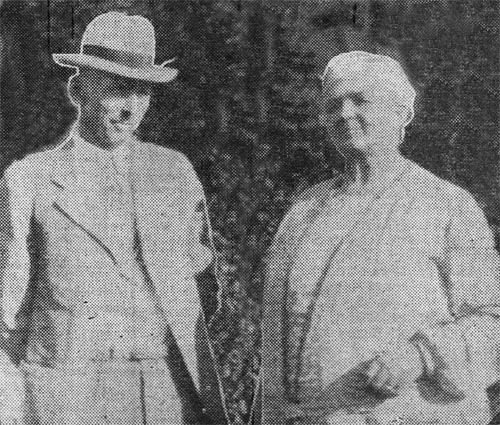 Homer and Mineola Myers. They had been married for forty years at the time of their murder. Both are buried in the Marion Cemetery. Homer Myers, 65, was a well-respected and prosperous farmer as well as a locally renowned horse and cattle breeder while Mineola, 67, was well-known in social circles. Both of them were born and raised in Marion County. 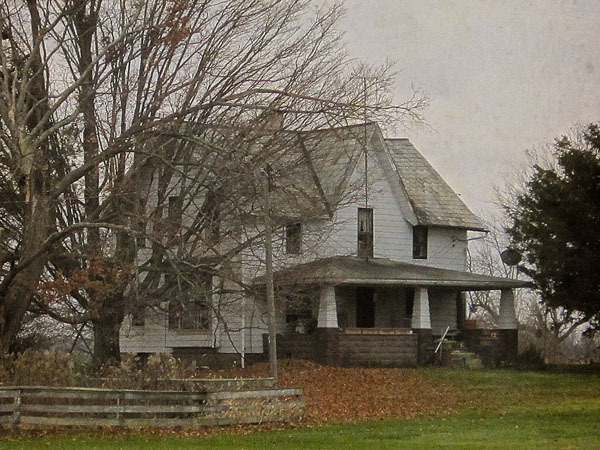 Mr. Myers was, in fact, born on the very same farm where he was slain, and at the time of his death, it had been in the family for four generations. Why anyone would want to murder two such well-regarded people was a mystery. Investigators initially assumed that robbery-gone-wrong was the most likely scenario. However, this theory began to fall apart when the Myers’ son said that no valuables appeared to be missing from the fire-damaged house. Investigators became convinced that Mr. Myers had known his killer after the coroner provided them with one small but significant detail about Mr. Myers at the time of his death: He had partially chewed peanuts in his mouth when he died. They speculated that Mr. Myers must have known his killer if he felt at ease enough to eat in front of him. The Myers farmhouse is still standing today and is clearly visible from Route 423. This photo was taken in October of 2015. 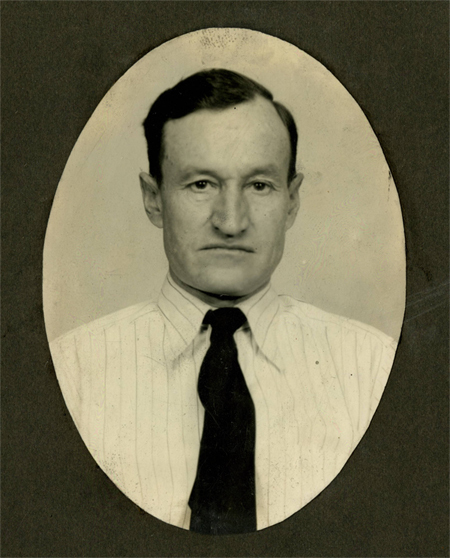 Harvey Roush lived in a small house on the Myers Farm where he worked as a tenant farmer. On the surface, he didn’t seem like the type to carry out a brutal double homicide. Roush was originally from Seaman, Ohio in Adams County, but he had come north to Marion looking for work in around 1933. At the time of the murder, he had worked on the Myers farm for about four years and, according to another farmer interviewed in the Star, “enjoyed a good reputation for peace and quiet.” He was married and had seven children ranging in age from 11 to 21. Up until the Myers murder, he had never been in trouble with the law. But Roush also had money problems. Years earlier he’d had his own farm in Adams County but he eventually lost it due to debts. He also owed money to Mr. Myers. When he began working for Mr. Myers, he borrowed just over $1500 , but at the time of the murder, Roush had only managed to pay back $100 of it. At a time when the average household income was approximately $1700 per year, this was a sizable amount of money. On Sunday morning, the day after the murder, investigators drove out to the Roush residence. Harvey Roush told investigators he’d gone with his family into Marion on Saturday, where they planned to do some shopping and then catch a movie at the State Theater. However, at some point Roush had split up with his family and gone instead to a few downtown bars. He claimed he later dropped in on the film his family was seeing – he didn’t sit with them – for 30 or 40 minutes before leaving again. This story struck investigators as strange but not incriminating, and they eventually left. Later that day they returned, and when prosecuting attorney Paul Michel asked Roush a few questions about the movie he claimed to have seen, Roush couldn’t answer them. At that point, Mr. Michel ordered the sheriff to arrest him. Once in custody, Roush almost immediately confessed to the murders. While his family was watching the movie at the State Theater, Roush went back out to the Myers Farm where he told Mr. Myers he was ready to pay off his $1405 debt. However, as soon as Mr. Myers marked the note as paid, Roush shot him in the head with a .38 caliber revolver. Mrs. Myers heard the shot from a nearby room and began screaming. Roush shot her as well, but she didn’t die, so he beat her to death with a rifle belonging to Mr. Myers. Roush then set the house on fire, threw the murder weapon in the Scioto River on his way back to Marion and picked up his family. When the Roush family returned to the Myers farm, the farmhouse was still burning, and Roush even helped fight the fire. During his confession, Roush admitted he had planned the crime for several days before he carried it out. On May 6th, while in custody, Roush attempted suicide by slashing his own throat with a razor blade. Roush was already on suicide watch because, during his confession, he admitted he had initially planned to “do away” with himself after murdering Mr. and Mrs. Myers. Although he lost a large amount of blood, he eventually recovered. Although he had confessed to the murders, during his June 11th arraignment, Roush plead not guilty. On July 18th, as his trial was about to begin, Roush changed his plea to not guilty by reason of insanity, and this caused a delay in the trial. He was sent to the notorious Lima State Hospital for the Criminally Insane for 8 days where doctors eventually declared him sane. The trial finally got underway on August 1st, 1938, and despite the oppressive heat, the courtroom was packed during the trial. Prosecutor Paul Michel decided to try Roush only for the murder of Mr. Myers (with a trial for the murder of Mrs. Myers planned should he fail to get a conviction). The interior of the Myers farm after the fire. 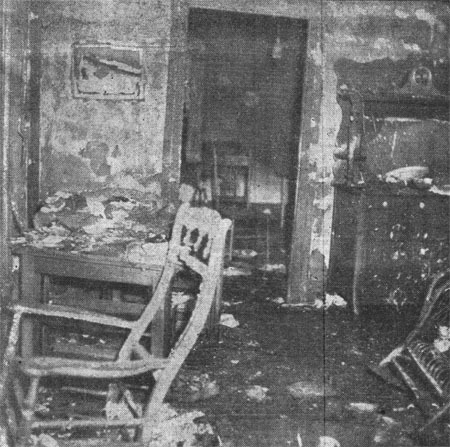 The room in the foreground is the dining room where Mrs. Myers was found. The room in the background is the downstairs bedroom where Mr. Myers was found. During the trial, Roush took the stand in his own defense where he made a couple of outrageous claims. For one, he said Mr. Myers had made unwanted advances on his wife, Virgie, that had enraged him. However, Roush also claimed that he didn’t actually carry out the murders; instead a former farmhand named Joe Cammon had done it for Roush. No one took either of these claims seriously, and neither Mrs. Roush nor Mr. Cammon was ever called to testify. On August 15th, 1938, a jury found Roush guilty of the murder of Mr. Myers. They did not recommend mercy, and Judge Hector Young sentenced Roush to death. The trial had lasted six days. Although members of the Roush family were seen off and on during his trial (especially Mrs. Roush), no one from his family was present during sentencing. At 8:03 p.m. in front of 130 witnesses (53 of whom were from Marion County), the prison warden gave the signal, and for one full minute an electric current passed through Harvey Roush’s body. At 8:04 a doctor declared him dead. Roush’s last words were, “I shall not kill.” This sentence caused considerable debate among the spectators. Was he talking about himself? Or admonishing the state that was executing him? We’ll never know. After Roush’s execution, his wife applied for relief (i.e. welfare) for herself and the two youngest children who still lived with her. She could only stay in the tenant house for a few days after the murder since the property was almost immediately involved in probate court proceedings. When Mr. Roush died, the family had no money in the bank and no life insurance. During his confession, Roush had said that his motive for killing the Myers was “to end my own trouble and fix a little future for my wife and family.” How tragic, then, that Roush left his family with nothing. Wow , went to school in Marion, but never heard about this. Lived in Marion my whole life and I still haven’t heard about this stuff. Since the house is still standing, I’m guessing the fire was only in one or two rooms? Can you provide the actual address so I know where it is when I drive 423? 4665 Marion Waldo Rd. Very interesting. I sell homes and always get asked questions like this. In my business, it wouldn’t matter to me because I think all homes have stories but very interesting. Very sad. Stress and money make people do inconceivable things. Harvey is my great grandfather! Thanks for this story. This is a discovery for myself and my family. Thanks for this story. Harvey is my Great Grandfather straight up. This was a discovery for myself and my family, as this was unknown history. This is my great grandfather as well! I stumbled upon this several years ago and yes it was quite a shock.